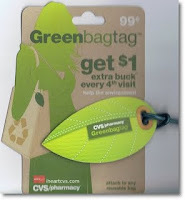 Check out all Target.com printable coupons HERE. Final Price: FREE with $1 profit! Final Price: FREE with $10 profit! Get a coupon from the Extra Care Coupon Machine for $5 off your purchase of $15 on items from these two pages! Picaboo Buy 1, get 1 Promotion - 9 Days Left! There are just 10 days left to take advantage of one of Picaboo's most popular promotions. Through midnight Pacific Time on November 15th, you can get a FREE copy of any Classic Photo Book or Custom Calendar you buy with promo code BGFTHX. I visited my local Dollar General today and saw a sign on the window stating that on Veterans' Day, Thursday, November 11th members of the Military and their immediate families will get a 10% discount on their purchases. See your local store for the details. Walgreens will have Renuzit Fragrance Cones for $.89 (with insert coupon)starting tomorrow! You can get this coupon from Facebook to get it for free! You can also register to get a freebie sent to you as well! 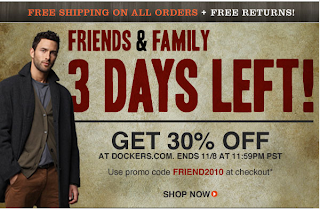 Dockers is having a Friends & Family Sale where you can score up to 30% off all orders and get FREE shipping! Use promo code : FRIEND2010 at checkout. Promotion ends 11/8. In-Store coupon HERE. Online, use promo code : WXF011H1. REMINDER : Kmart Friends & Family Starts TODAY! It's that time of the year again for Kmart's Annual Family and Friends Event! 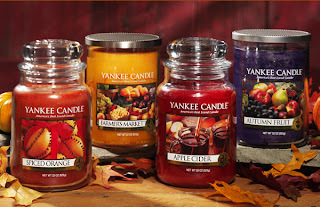 The nationwide sale will be online and in stores all day Sunday, November 7, except for a handful of states. In Utah, Idaho and New Jersey, the event will be on Saturday, November 6. Apparel, accessories, jewelry, footwear, and some items for infants (baby monitors, strollers, car seats, cribs, etc.) will be 20% off for this once-a-year sale (including regular-priced and clearance items). Almost everything else will be 10% off, including Sporting Goods, Toys, Seasonal, Edibles, Consumables, Hardware, Appliances (not major Appliances), Hard Home, Soft Home, Stationery, Beauty, Health, Electronics, Entertainment and Auto. If you shop online your discount will automatically be taken off. If you plan on shopping in the store, you will need to print off this flyer and take it with you. 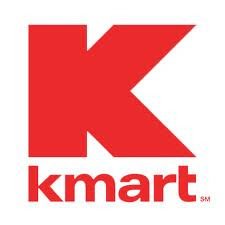 So get a good jump on your holiday shopping and save some money at Kmart starting today!